On the mountain peaks you are closest to the heavens. 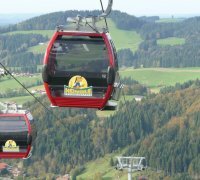 The three cable car systems at the Hochgrat, Imberg and Hündle mountains bring you safe and sound to the highest vantage points amongst the Oberstaufen mountain world. 4-seater cable car cabin. The Hochgrat mountain range is the highest in the western region of Allgäu at 1834 m. The summit is named the Nagelfluhkette – an impressive ridge. Here you can find the summit station restaurant with a sunny terrace at 1708 m, enjoy the breathtaking views across the alpine range in summer and winter. Summer: An ideal starting point for hikes. Winter: The slopes are cherished by skiers, snowboarders and free-riders, with its 6 km long descent. 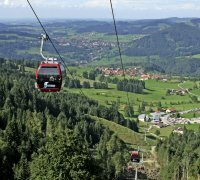 With Germany’s most modern high-tech cable car system, boasting 8-seater cabins is an ideal spot both in summer for walking and in winter for sports. Summer: family friendly walking trail with interactive areas for the children to play and enjoy. Also an animal enclosure with small animals to stroke and feed, a great playground, an exciting toboggan run and crazy golf. Winter: 8-seater cable car cabins, 3 draglifts, snow making machines. In conjunction with the ski-lifts at Thalkirchdorf the areas are connected. Here are 3 draglifts, 3 beginners lifts, snow making machines, offering floodlit skiing from Tuesdays to Fridays from 18.00 hrs. – 21.30 hrs. Equipped with an 8-seater cable car this is an ideal leisure area all year round. The ski slopes in winter and walking in the warmer seasons are ideal for families - with prams or on longer hikes. Winter: 8-seater cable car, 6-seater chairlifts, 10 draglifts, Fun Park, Children’s Land, floodlit sledging run, snow making machines. Maria Heim › Hi Viviane, thanks for your message. In Steibis, which is a district of Oberstaufen, there is a place for RVs at "Wohnmobilstellplatz Bechteler". From there it is only a ten minute walk to the "Imbergbahn" cable car. When will you be here?